1. Someone who commits fornication or extramarital relations between partners who are not married to each other. 2. Etymology: from Old French fornication, from Late Latin fornicationem (fornicatio; from fornicari "to fornicate"; from Latin fornix, "brothel"; originally "arch, vaulted chamber"; from fornus "arched or domed shape". Roman prostitutes commonly solicited customers from under the arches of certain buildings; therefore, fornication means, "intimate relations between an unmarried man and an unmarried woman"; extended in the Bible as adultery. The fact of being darkened or overshadowed. 1 A superior or favorable position in relation to someone or something: Henry was hoping to gain an advantage in his negotiations with the company. 2. A circumstance or factor that places a person in a favorable position in relation to another individual or to other people. 3. Etymology: from Old French avant, "before"; from Latin abante, "before". A departure from the usual decrease of temperature with increasing altitude, caused by advection. A reference to or caused by advection (the transfer of heat, cold, or other atmospheric properties by the horizontal motion of a mass of air). 3. Not in the usual order or place. 4. Not natural or hereditary; such as, roots that form on stems, a growth of hair where it usually does not grow, or the growth of a plant in a foreign habitat. A leaf bud that occurs in an unusual position; such as, on leaves or roots. 1. That which comes to us, or happens without design; chance, fortune, luck. 3. A hazardous or perilous enterprise or performance; a daring feat; hence, a prodigy, a marvel. A word used to modify (describe) or limit (make specific), the meaning of a verb, an adjective, or another adverb. 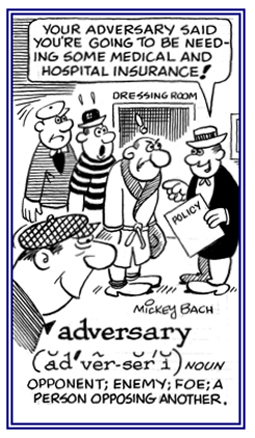 Most adverbs are formed by adding -ly to adjectives; however, adjectives ending in ic add ally: basic, basically. Others, such as well, "far, low, hard, early", and "fast"; have the same form as adjectives. In summary: adverbs tell manner (how), time (when), place (where), degree (how much), and sometimes cause (why). 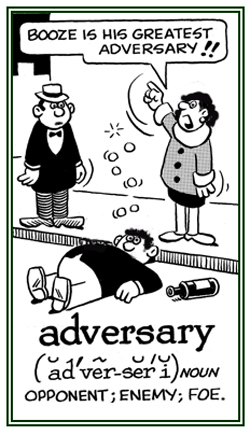 Adverbs of manner: "politely, carefully, not, equally, tenderly". Adverbs of time: "now, then soon, later, early, often". Adverbs of place: "here, there, near, forward, far." Adverbs of degree: "very, so, much, too, extremely, rather." Adverbs of cause: "why, therefore, hence". 1. A person who, or that which, takes up a position of antagonism, or acts in a hostile manner; an opponent, antagonist; an enemy, a foe: The governor's political adversaries tried to keep him from winning a second term in office. 2. Etymology: from Anglo-French adverser, from Old French adversier, from Latin adversarius, "opponent, rival"; literally, "turned toward one", from adversus, "turned against". © ALL rights are reserved. Showing page 10 out of 12 pages of 168 main-word entries or main-word-entry groups.